Today we may think we can’t enjoy an evening of hospitality with Jesus, listening to him laugh or sigh as he told stories, as Mary did, or fuss in the kitchen cooking up a ‘fine dinner’ like Martha. We may believe we can’t push through the Roman soldiers because all we see is Jesus in pain and wipe his face with compassion as Veronica did. Nor may we see ourselves helping “lift the load” from Jesus’ back as Simon of Cyrene or giving Jesus’ body the dignity of a (temporary) burial like Joseph of Arimathaea. 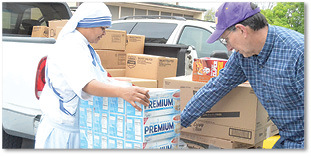 The St. Vincent de Paul Society allows people to pour out their love to Jesus by serving the poor in different capacities, said SVDP executive director Michael Acaldo. “You can see all the wonderful things – people taking care of each other and the tremendous energy and excitement of serving people. It’s contagious,” said Acaldo. Among those enthusiastic volunteers are Kay and Chris Gaudet, who volunteered because of their involvement in social justice and a desire to set an example for their children. Both are retired pharmacists (Chris from Elayn Hunt Correctional Center in St. Gabriel and Kay from the Louisiana Department of Health) who met in pharmacy school and will be married 45 years in May. After raising two children and retiring from busy careers, the Gaudets looked for an opportunity to “give back” together and explored the volunteer opportunities on the SVDP website. “We were attracted to the fact that there was a dining room as well as a pharmacy,” said Chris. They both initially served in the dining room, but Chris was later asked to help in the pharmacy. Sometimes he walks over to the dining room, puts on an apron and joins Kay on the serving line. Their social justice initiatives have rubbed off on their children. Their younger daughter, Katherine, has been a big sister to a youth in Philadelphia for about seven years and their older daughter, Christy, has been on mission trips using her expertise in biomedical engineering to help people in places such as India. And in the aftermath of Hurricane Katrina in 2005, the Gaudet’s daughters served evacuees in Georgia and Alabama. The couple said they believe doing the corporal works of mercy is prayer in action. Chris recalled a homily by Father Pat Mascarella, deceased, in which he talked about not keeping God inside the church. “He (Father Mascarella) talked about how God wants us to open the doors and go outside the church and do the work that he asked us to do,” Chris said. This is also the belief of Terry Cormier and Chris Willis, who work alongside the sisters of the Missionaries of Charity at St. Agnes Church in Baton Rouge. Willis said he sees his volunteer work as an opportunity to evangelize. 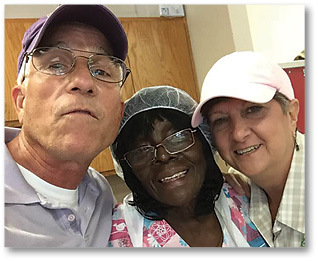 Chris Gaudet and wife Kay, right, take a photo with St. Vincent de Paul kitchen technician Hilda Kelly. Photo provided by Chris and Kay Gaudet. “Terry is like the brother I never had,” said Willis. Cormier and Willis said in addition to developing friendships with those serving, they enjoy their fellowship with the sisters. Willis said he started volunteering at St. Agnes by serving meals but the sisters soon “pulled him away” to do other things, such as unloading food shipments, sweeping, mopping, changing light bulbs, taking out the trash and other “handyman” type of work. He receives his “marching orders” once he arrives at St. Agnes. He chauffers the sisters around the neighborhood to deliver food to shut-ins as well as to funerals. Corporal works of mercy can also include serving those who have given their life in service, such as military veterans, according to Clayton Landry. Landry, who still visits St. John the Baptist Church in Zachary after moving to McComb, Mississippi, said he did not want to give up his ministry at the Louisiana War Veterans Home in Jackson. He makes the long drive every first and third Thursday of the month to be with the veterans. An Army veteran himself, Landry was a helicopter mechanics instructor. He and his wife were one of two couples who started volunteering at the nursing home. When there is a Mass or Communion service, Landry, 74, brings out the veterans in wheelchairs and distributes the Eucharist to those unable to come. “I look to them as heroes. Sports figures and celebrities get paid big money to be called heroes, but to me these men put their lives on the line and often weren’t appreciated for it,” said Landry.